McManus Entertainment are excited to announce The Darkness and legendary rock goddess Joan Jett and her band The Blackhearts for four very special co-headline shows in April. The rise, fall, and rise again of The Darkness contains all the ingredients of a classic rock opera. The basics are a matter of public record: unfashionable good-time hard rock band from Lowestoft slog their way around the Camden pub circuit, build a word-of-mouth following that can fill theatres without a record deal, then rocket to world stardom selling over 3 million copies of their debut album worldwide, winning three Brit awards and becoming one of the biggest British rock bands of the Noughties. 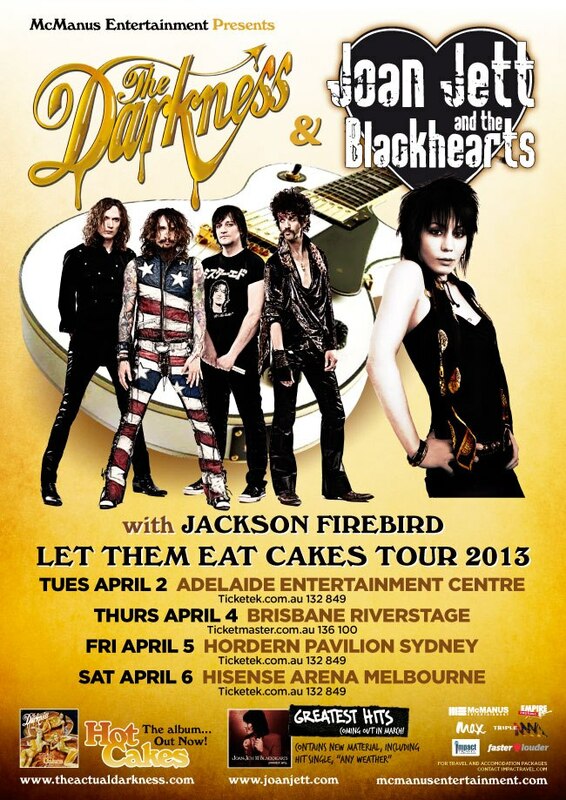 The original line up of Justin Hawkins (vocals/ guitar), Dan Hawkins (guitars/ backing vocals), Frankie Poullain (bass), and Ed Graham (drums) return to Australia in May. Joan Jett is an originator, an innovator and a visionary. As the leader of the hard-rocking Blackhearts, she’s had eight platinum and gold albums and nine Top 40 singles including the classics Bad Reputation, I Love Rock ‘N’ Roll, I Hate Myself For Loving You, and Crimson and Clover, and she sits at the head of her own independent label, Blackheart Records. Since co-founding the Runaways, the pioneering all-girl punk quintet, at age 15, Jett’s determination and drive have kept her in the public eye. Jett was able to see her story told in The Runaways, the film based on (lead singer of The Runaways) Cherie Currie’s book Neon Angel starring Kristen Stewart as Jett, and her fellow A-lister Dakota Fanning as Currie. Jett was close to the project: She served as an executive producer. In 2010 Joan Jett and The Blackhearts came to Australia after a fifteen year absence to headline The Falls Music and Arts Festivals in VIC and TAS, and Sunset Sounds in Brisbane, gathering a whole new generation of Aussie fans who fell in love with her classic tunes and unflappable punk rock attitude. Garage rocker’s Jackson Firebird will join the tour nationally. *Line up subject to change without notice.